Chicken Salad Chick, America’s only southern inspired, fast casual chicken salad restaurant, was founded in 2008 in Auburn, Alabama, by Stacy and Kevin Brown. What started as a small takeout restaurant quickly grew through the Southeast. The founders believe in instilling a strong culture of hospitality across all team members and locations, and pride themselves on delivering southern style chicken salad served from the heart. Approximately 75% of Chicken Salad Chick locations are franchised, with the remaining 25% being company owned. The franchise owners are carefully selected, ensuring that the Chick culture is maintained to the highest degree. It all began in the year 2013 when Chicken Salad Chick started growing at a rapid pace. By July of 2013, it already had six locations, was still expanding its franchise sales and planned new openings. There was a need to quickly onboard team members, acclimate them into the brand culture and build their confidence. The training curriculum needed to satisfy these needs by providing newly hired team members with the knowledge and skills to be successful. The more confident they become, the more their personality shines through when interacting with other team members and guests and the better they are able to reflect the Chicken Salad Chick culture. Initially, new restaurant training was conducted in person by the two founders, and later by a team of corporate trainers. But there was no training for team members on an ongoing basis. The original team members could execute brand standards in the restaurants because they had the knowledge and skill to do so; however, newly hired team members’ knowledge and skills in these existing restaurants varied greatly depending on who showed them what to do when they were hired. 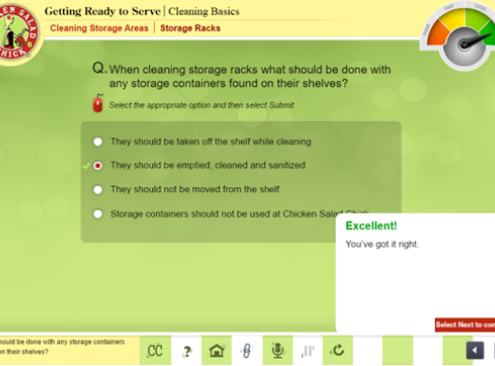 Harbinger realized that the Chicken Salad Chick team needed a solution that would standardize training in every restaurant and removed the variability witnessed between the trainers in each of its restaurants. The Harbinger team in association with the Chicken Salad Chick team chose and implemented a blended learning approach in the form of a Team Member Development Program. The target audience was analyzed to be enthusiastic and culturally diverse, young males and females, with no knowledge of Chicken Salad Chick (CSC) processes and procedures. Based on this analysis, Harbinger decided that short courses were to be created, ranging from 10-15 minutes, to engage young learners and specialized skills were to be complemented with hands-on training. Each course needed to have a learner-centric design and also needed to enable learners to connect the learning to the real world. There have been many measurable benefits from this program’s implementation. Chicken Salad Chick rolled out the team member development program on 4/25/2016. Since then about 400 students have already completely 4700+ courses. 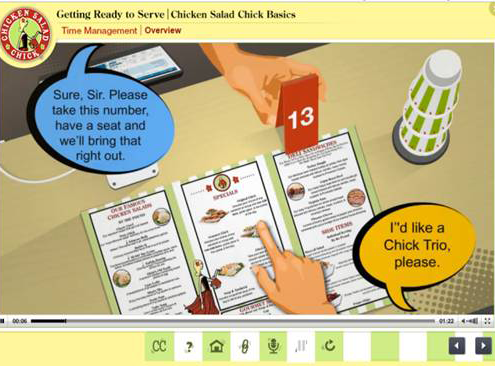 Chicken Salad Chick’s Learning Management System (LMS) allows users to provide three levels of feedback: comments, ratings on a 1 to 5-star system and likes. The learners have been very positive about the training program and its courses. 46 ratings have been received within 6 months from the day the courses were launched. All of these ratings have been either 5/5 stars or 4/5 stars. They’ve have also had 201 ‘Likes’. The key trainers feel the courses are helping new team members learn more quickly than the previous program. New team members have shared that they think the courses are fun, simple and easy. The improved training also helped team members execute the brand standards at a higher level. 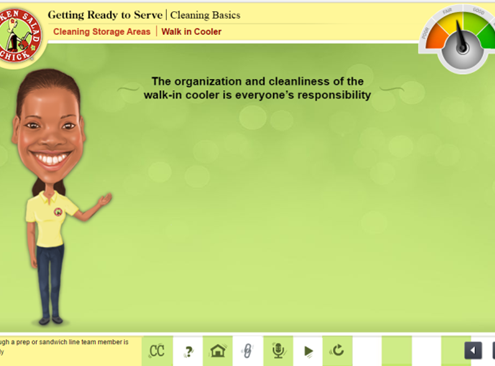 This case is a classic example of how targeted training can imbibe and impart the essence and the culture of an organization such that it reflects in each screen of every learning module developed. Such training, when implemented, also helps instill the same culture in all the learners who undertake it. We, at Harbinger, are proud to serve Chicken Salad Chick as their partner till date, and are also glad that we helped them achieve their goals and retain their Chick culture so beautifully.